an architecture: Color. Le Corbusier - Polychromie Architecturale. Color. Le Corbusier - Polychromie Architecturale. Twentieth century's modernist architecture is mostly white - but not for Le Corbusier - where hardly any design comes without color. He used accent colors, picked from his "Polychromie architecturale", in contrast to the usually white or raw concrete surfaces. The palette includes 68 shades and 16 white tones, white each color containing only organic pigment. It results in greater harmony between those colors. Over the years Corbusier has shifted the palette from lighter shades to a more saturated version in his late work (50s). 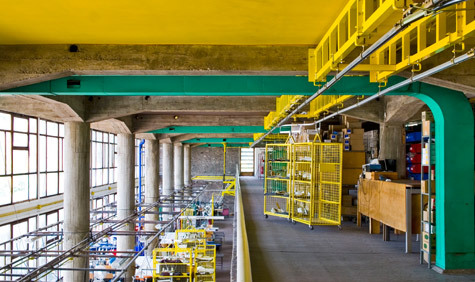 The Claude & Duval factory (built in 1051) is an example of Corbusier colour experiments: walls, ceilings and even pipes are painted and contrast to the raw wall surfaces.